CarGurus has 25,971 nationwide Expedition listings starting at $1,200. Full-size, body-on-frame sport utility vehicles have become wooly mammoths lumbering among a jungle full of parakeets. The 2014 Ford Expedition is one of these ponderous pachyderms, a bulked-up, fuel-guzzling relic that nonetheless retains a place in the modern world. Seating up to 8 passengers, toting up to 130.8 cubic feet of cargo in its stretched variation and powered by a potent V8 engine, this throwback, though in need of an update both design- and features-wise, provides the heavy-duty hauling and backwoods chore capability that less muscular crossovers and vans are afraid to tackle. A total of 4 trims, the base XL (or XL Fleet), the upscale XLT, the upper-middle-class Limited and the top-shelf King Ranch are each offered in 2 trim levels, the standard-size Expedition and the stretched-out Expedition EL (Extra Length), which flaunts an additional 14 inches of overall length. Anyhow, this F-150-based sport ute changes little from 2013, with the only notable upgrade being an available new mechanical load-leveling suspension system replacing the noisier air system of yore. There are rumblings among reviewers that if the Expedition had remained in line for the performance and feature upgrades Ford has instituted in its full-size pickups, this outsized heavy hauler might look and feel a tad more consumer-friendly. Nonetheless, this super-size ute again comes with standard rear-wheel drive (RWD), which might be great for southern climes, but it also accommodates those inhabiting less temperate zones with available on-demand 4-wheel-drive (4WD) configurations with a 2-speed transfer case and auto-locking hubs. Meanwhile the 310-hp 5.4-liter V8 powerplant remains the standard (and only) engine offering, with the well-wrought 6-speed automatic transmission again allowing some 365 lb-ft of torque. Towing is again maxed out at 9,200 pounds with the proper equipment, while mileage in both editions of the Expedition line remains 14 mpg city/20 highway for RWD editions and 13/18 for 4WD variants. The base XL trim boasts standard 17-inch alloy wheels (18-inch for the EL trim level), as well as skid plates, a roof rack, side steps, heated power-adjustable mirrors and a trailer hitch and wiring adorning its brutish profile. Inside, look for cloth upholstery, a power-adjustable driver’s seat, reclining rear seats, full power accessories, reclining second-row seats, and leather and simulated alloy cabin accents. Cruise control, of course, also adorns this base trim, as do tilt-wheel steering, an auto-dimming rear-view mirror, and front and rear air conditioning, while a 160-watt sound system boasts a single-CD player with 6 speakers. Moving up to the XLT, expect such additional bling as standard 18-inch wheels in both regular and lengthened versions, as well as all-terrain tires, power-adjustable pedals, a remote garage door opener, rear parking sensors, Sync directions and Bluetooth-interfaced audio and communications technology, satellite radio and a USB port. The upscale Expedition and Expedition EL Limited offer auxiliary transmission cooling, a heavy-duty trailer hitch and a power rear liftgate, with premium leather upholstery adorning the heated power-adjustable front seats. This upper-midlevel trim also sports power-folding third-row seats and upgraded simulated wood and simulated chrome cabin accents, all of this bolstered by tri-zone climate control and memory for driver's settings. A 340-watt stereo system, meantime, flaunts 7 speakers including a subwoofer. Finally, the flagship King Ranch boasts all the Limited’s standard goodies and adds standard Chaparral leather upholstery, premium audio components and front and rear parking sensors. As is common, options for the lower Expedition and Expedition EL trims include a number of items found standard in the higher trims, while remote engine start and a fuel-saving 3.73 rear axle ratio are available to all trims. Optional for the XLT and higher trims, meanwhile, are a power moonroof, upgraded and upsized wheels, rear-seat DVD entertainment and voice-activated hard-drive-based navigation, along with heated second-row seats and second-row captain’s chairs (which cut passenger seating by 1). Rounding things off, noteworthy standard safety features in the 2014 Expedition and Expedition EL lineup once more include 4-wheel antilock brakes (ABS), traction and stability control, trailer sway control, front side-mounted airbags and 3-row head airbags. Added to this are standard front fog/driving lights and Ford’s touted MyKey parental programming safety system, lineup-wide, as well as dusk-sensing headlights, a post-collision safety system and a remote antitheft alarm. The XLT and above trims again flaunt standard Sync emergency assistance communications and alerts, with the Limited and higher trims boasting standard turn-signal-integrated mirrors. 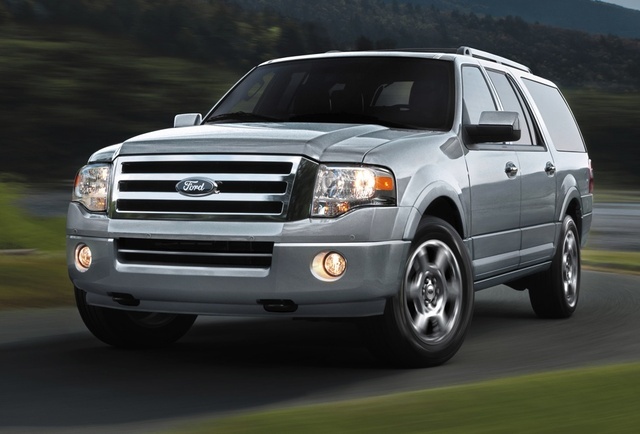 What's your take on the 2014 Ford Expedition? John I'm buying a 2015 Expedition. I tow a 5,500 lb boat several times a year. Is the load leveling option necessary or will the normal tow package do the job without any leveling issues? 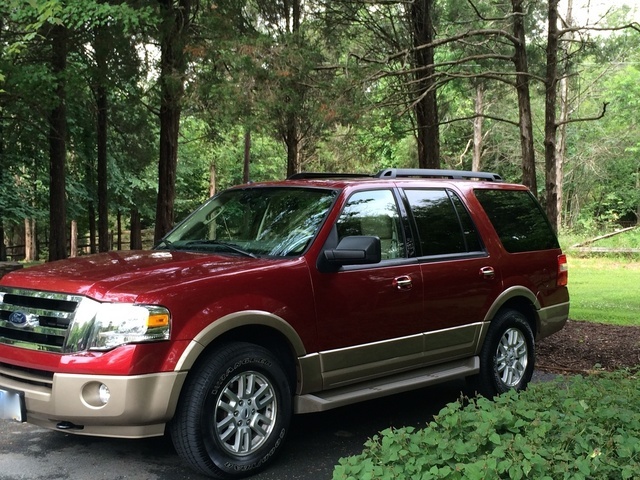 Have you driven a 2014 Ford Expedition? The dome lights in the center of the vehicle stay on. I didn't notice them on because the DVD blocks them from my view when driving. Does anyone know what is going on with this. my 2014 expedition is listed as 2 wheel drive. Does that mean it is not front wheel drive?